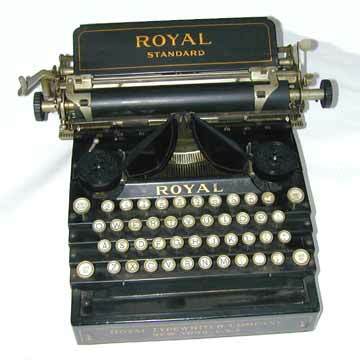 The Royal typewriter entered the market in 1906. It would grow to be one of the leading brands that would dominate the market together with the Underwood and the Remington. That alone should be enough to earn a place in a museum. Having said that, the fact is that apart from the very first 'flatbed' models, the Royal is not the most exciting machine in the world. But it wasn't intended to be exciting or revolutionary. The Royal was intended to be a sturdy work horse. The design featured numerous improvements over earlier machines, that were the work of the company's founder and vice-president E.B. Hess. Hess had from the beginning aimed at building the ultimate visible writer. His first patents dealt with a nine-bar typewriter with revolving sleeves, each carrying nine characters. Hess himself decided that his invention was a 'freak', and it was never built. He went on to improve existing machines and by 1923 he was reported to have collected more than 140 different patents dealing with typewriter technology. By 1910, even the backside of his Royal 1 was barely big enough to list the patents covering this first machine. (pic 6). The Royal 1 was followed by the Royal 5, a similar flatbed machine. (Other model numbers had to do with different carriage widths.) In 1914 the upright Royal 10 appeared. This was the classic model with beveled glass sides that would grow to be one of the market leaders. For more details see the book TYPEWRITER, page 178.